Go to properties for the tracks and delete it. If the album has a single disc then having a tag that says disc 1 is redundant information. If the album has several discs then the fact that disc number is not displayed as a header in MM4 is a problem. The addition of this disc number header to MM5 for multiple disc sets (I always delete disc 1 for single disc albums) is a great improvement. 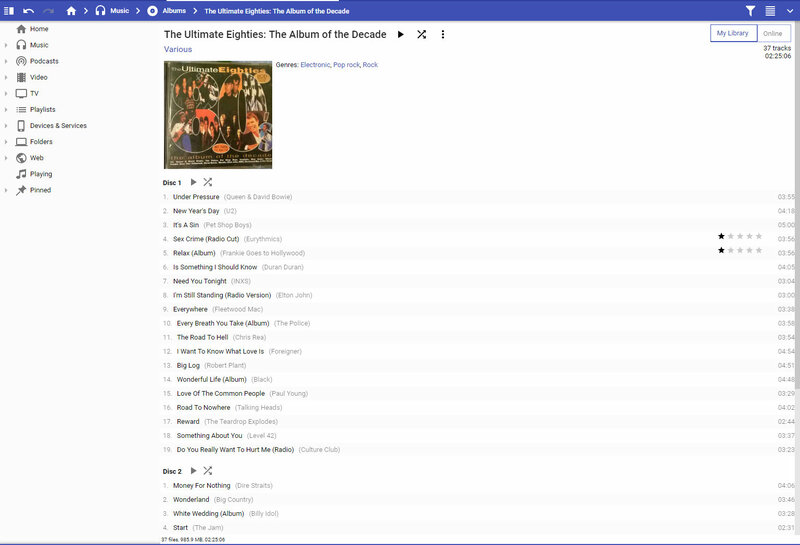 It's pretty much the standard way of displaying this information in recorded music databases (https://www.deutschegrammophon.com/en/cat/4576192 for example). The only improvement in MM5 I would like to see is the ability to name the discs in multiple disc sets (such as Act I, Act II, etc for operas - the Mutter album has redundant names for the discs, but shows the idea). Can you please make screenshot what you are referring to? I agree with Yarguy that some views should show disk number as it clearly represents Release and its backup. Sorry, but I have to disagree. Having all the discs in a set appear when I choose one is just what I do want. Many of the muitiple disc sets in my collection have a composition that will not fit on one disc (a number of Mahler symphonies, for example, as well as almost all operas). Until MM5 has a way to play all the tracks in a composition with one click (see how roon does it, though I think that requires paying rovi for access to their database) I need to have all the tracks displayed so I can highlight them. In other cases, I usually do not remember (nor do I want to have to remember) which disc in a multiple disc set has a particular composition (which of the 10 discs in Chicago Symphony's complete set of Mahler symphonies has symphony number 9? ); having them all displayed rather than having to click through disc by disc makes finding the one I want much simpler. On your other point about wanting to have 1 in the disc tag for single discs, I would point out that most of the single discs I download (primarily from Presto and Bandcamp) do not have anything in the disc tag anyway. You are, of course, free to organize your tracks as you want, but not at the expense of having MM remove one of the useful, important improvements that has been made in MM5. On the other hand, MM wouldn't be any less of a great app without, as simply deleting the disc# tag - if bothering - is just as easy within it. I am very fastidious with my tagging. I do everything manually to ensure accuracy, and I am NOT about to delete tag data to remove it. I can't believe anyone would suggest deleting tags to overcome a shortcoming of a player. The idea was that people usually use Disc# only to distinguish multi-disc albums and leave it empty otherwise -- which obviously isn't what everybody does. As I'm not a fan of too many configuration options, I'm not sure what's the best resolution of this. Some people will like to show disc# there, since the field really is filled in, while others don't like it for single disc albums. Thoughts? Then again, what if there are other details like this one, some people don't feel comfortable with? Since MM5 is based on Chromium AFAIK, I thought the layout must be some sort of HTML or XML - and it is, I've gone through the files. Which might be a great basis for individually adjustable layouts, like u could start MM's fabulous layout configurator, showing tabs for Album View, Artist View etc. Then, a list of details being displayed there - and u could just uncheck what you don't want to be shown. But in this very case - with conditions as well!